Congratulations to Team Canada on winning back-to-back Brier tournaments! With that, the Canadian national tournaments are over for the season, and two teams are off to represent us at the Worlds! Now, a lot of people don't find curling to be all that exciting. A lot of that comes from individual taste - some people haven't played curling or aren't from rural Saskatchewan, and without having been there before or having a vested interest in the teams, maybe some of the intricacies aren't all understood. Either way, for the more ardent curling fans, the game is often very exciting. But some games are undeniably more exciting than others, and apart from the final score is there a numerical way to determine which games are the most riveting? Sure there is! It's called the Excitement Index. I first came across the Excitement Index (EI) in the context of the National Football League, where the owners of 'Advanced Football Analytics' have developed a model that predicts each team's chances of winning a football game after each play. They decided to develop an EI based on the absolute sum of chances in winning percentage throughout the game. 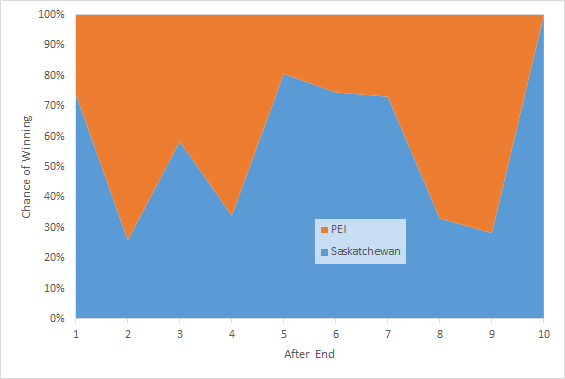 A game where team storms to an early lead and holds it will have a much lower EI than one that's back and forth all game, and similarly a modestly successful play early in the game will likely have less effect on EI than one that clinches the game in the last minutes. So I came up with a similar system for curling. Instead of looking at it play-by-play, I came up with a model that predicts winning percentages based on the score after each end. 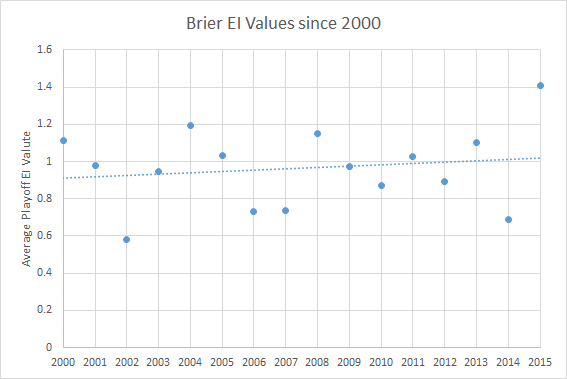 For instance, I now know that over the last 15 years of Brier tournaments, a team that's been up by 1 after 4 ends with the hammer has won 80% of the time. Last year, British Columbia got 2 with the hammer right off the bat, then stole one, leaving them up 3 without hammer after two - a very strong opening that historically results in a win 91% of the time. 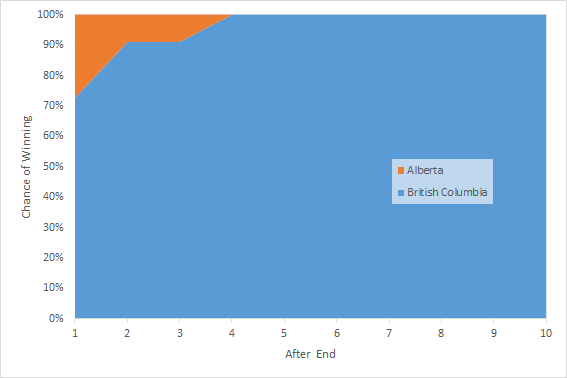 Alberta then only got one with the hammer, but in doing so gave the hammer back to BC for only a one-point trade, resulting in no real change in probabilities. BC then got 3 with the hammer, and the game was essentially wrapped up by that point (6-1 after 4 is virtually insurmountable for teams at the Brier). The sum of changes in probability in this game was only 0.27 after the first end - not a terribly exciting game. Nova Scotia started off not too well, only getting one with the hammer. 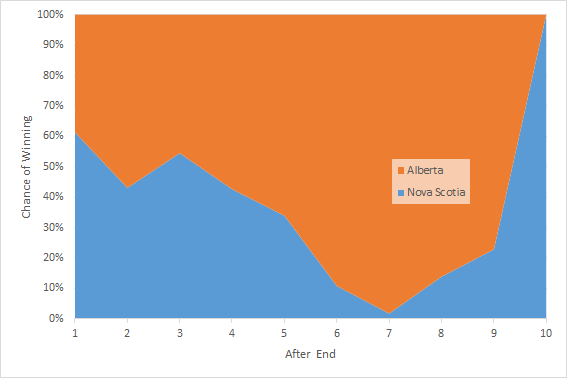 The teams then traded 2-point ends, which resulted in a lot of back-and-forth in terms of probabilities while slowly inching in favour of Alberta. NS only getting one in the 5th was bad, but not quite as bad as AB getting three in the sixth. At this point it was 8-4 after 7, and being down by 4 after 7 with the hammer only has a win rate of 1.6%. The rest of the game was improbable, to say the least, and made for a very exciting finish. The total EI was 1.87, about 6 times 'more' exciting than the previous game. With all of the high-scoring ends at the beginning, and winning with a steal at the end, the back-and-forth swing throughout this game led it to a massive EI of 2.76. All this leads to the fun finding that the 2015 Brier playoffs were the most exciting in recent history! Averaging the EI values for all games in the playoffs gives an average EI of 1.41 for 2015, with the final game (1.19) being the third most exciting final analyzed. Stay tuned for next week, when I use the historical model I have to look at when it's better to take a point as opposed to blank an end, and compare men's curling to women's curling in a little more depth!